For the spring season this year, Welsh National Opera have brought together two productions of the Manon Lescaut story: Puccini's Manon Lescaut and Hans Werner Henze's Boulevard Solitude. Though both operas relate the same story, based on the novella L'Histoire du chevalier des Grieux et de Manon Lescaut by the 18th century author Antoine François Prévost, they could not be more different. The lights go up on a busy railway waiting room, Des Grieux (Gwyn Hughes Jones) is curled upon a row of seats whilst the waiting room fills up. Edmondo (played as a cleaner) teases Des Grieux by stating what a beautiful night it is (Ave, sera gentile, che cliscendi. . .). Des Grieux bemoans his loneliness and his failure to find love (L'amor I Questa tragedia,ovver commedia). A woman steps into the crowd and Des Grieux is captivated. As she sits at the bar in the waiting area he approaches her tentatively. One of the excellent devices that Puccini used in three of his operas, including Manon Lescaut, is the asking of the name. This is also done to great effect in his following opera, La Boheme where Rodolpho and Mimi reveal each others' names. In his final (incomplete) opera, Turandot, Puccini uses the device again in a dramatic and cruel manner. In Manon Lescaut, Puccini's third opera and the first time the device is employed in his work, Des Grieux asks for the woman's name, providing the first of many beautiful moments: Donna non vidi mai simile a questa! It is one of the standard arias of great tenors and Gwyn Hughes Jones sang it wonderfully. 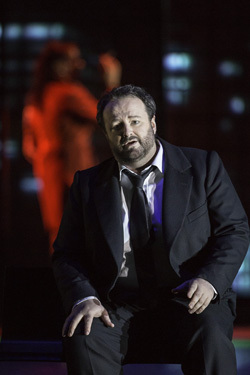 As the opera progressed Jones proved himself to be an excellent Puccini tenor; one of the best – if not the best – that I have heard in the years that I have been attending live opera. Manon had arrived at the station with her brother, named only as Lescaut and an older man, Geronte, to whom Lescaut hopes to pimp out his sister to in order to make some money. They are offstage from the beginning of the encounter. Manon, beautifully sung by Chiara Taigi, tells the hopeful Des Grieux that she is to go into a convent that following day. She hears her brother call to her and panics as both Lescaut and Geronte appear. Des Grieux pleads with Manon to meet up with him again. A distraction takes place as Lescaut plays cards with a group of people. De Grieux waits for Manon to come to him. Edmondo appears and tells him that an old man (Geronte) is to take her away (che olezzava poco fa). He helps Des Grieux and Manon to escape. Geronte and Lescaut arrive on the scene as they disappear, and Lescaut proposes that they follow. In act two Manon is with Geronte having abandoned Des Grieux because of his lack of money. Lescaut enters telling Manon how beautiful she looks and how fortunate she is to have abandoned Des Grieux's hovel for the luxury of Geronte's mansion (Sei splendida e lucente I M'esalto !). However Lescaut is concerned that his sister is not happy living with Geronte, and he sets off to find Des Grieux. When Des Grieux appears in Geronte’s house, Manon and he renew their vows of love (Oh, sarò la più bella! ), Geronte returns unexpectedly. He reminds Manon of the favours he has done for her. She tells him that she cannot love him (Affè, madamigella). He leaves and the two lovers rejoice (Oh, sarò la più bella! : tu, tu, amore? Tu?). Lescaut enters telling them that they must leave immediately. They go to the door only to find it locked by Geronte's order. Soldiers arrive to arrest Manon on the pretext of theft, she is dragged off and Des Grieux is not allowed to go with her. In act three Manon is in prison and Lescaut has bribed a prison guard to let Des Grieux speak with Manon. By talking to her through the bars, they learn that she is to be deported. They make a failed attempt to escape as the guard appears to take Manon away along with a group of women who are also being deported. Des Grieux despairs of his parting from Manon and begs the driver to let him go with Manon (No!... pazzo son!... Guardate come io piango ed imploro... ). The driver of the train takes pity on him and allows him aboard to accompany Manon. Act four finds Des Gieux and Manon struggling to find a life together. But manon is fading and whilst Des Grieux goes to find water for her Manon looks back on her past (Sola, perduta, abbandonata). Here Welsh National Opera have created a fantastic conclusion to the opera. On stage there are two Manons - one, the Manon that is in love with Des Grieux, the other the more selfish Manon. This greatly increases the ambiguity of her character and questions whether we should feel pity for her. It is interesting that the French composer Jules Massenet, had already produced a very successful opera of Prévost's story. Another French composer Daniel Auber, had also written an opera though it was not so successful - on the same subject with the title Manon Lescaut in 1856, though somewhat watered down. Puccini's publishers were against the idea of another opera based on the story, with Puccini declaring that Manon was a heroine and that the public would feel pity for her, adding "Massenet feels it as a Frenchman, with powder and minuets. I shall feel it as an Italian, with a desperate passion." This Manon Lescaut is a real triumph for Welsh National Opera. It would have been easy to have just presented a period setting but director Mariusz Treliński and set designer Boris Kudlička have created an intelligent updating that some may find cold, but I felt that the lack of sentimentality in their approach served the opera well. It was not cynical, but it helped to challenge our perception of the role of female characters in opera and particularly around the turn of the twentieth century with the rise of verismo. In one sense we can see the role of the central female character in these operas as a precursor to that of the femme fatale role that became the staple of Film Noir in post WW2 Hollywood. Whereas that could be seen as a reaction against the greater role of women in the wider society, the same cannot be said for the female character in opera, which appears as a continuation of the Romantic depiction of women as, if not pure, then in need of a hero to rescue them. This production of Manon Lescaut strips the opera of its Romantic pretensions, and though I am not averse to sentimentality in opera, this production added so much more than just a story of doomed lovers. It was a hard-hitting production, not what I was expecting. The violence of Geronte and his henchman reminded me of anther role that was the staple of Film Noir; that of the psychotic villain usually an underling for a bigger man (both in stature and status), such as Sydney Greenstreet and Peter Lorre in The Maltese Falcon. The cast are truly outstanding. Hughes-Jones and Taigi in the lead roles were extremely convincing and David Kempster (Lescaut) and Stephen Richardson (Geronte) brought a real sense of menace into the story whilst never once overdoing this. Special mention should also be made of Bartek Mascius, the video projection designer, whose work for the backdrop of the opera was very convincing, added greatly to our appreciation of this update. In the original libretto, Des Grieux and Manon escape in a carriage, in this production though, whilst the orchestra play an interlude we see a city flashing by, much as if we were looking out of a speeding train window. Henze's opera, or more precisely a Lyric Drama, is an update on the Prévost story. Based on the play by Walter Jockisch, the story opens in a railway waiting room where Armand des Grieux, a student, meets Manon Lescaut who is being brought to boarding school by her brother, simply known as Lescaut. Armand instantly falls in love with Manon, and the two run off together. Although living in poverty the two lovers are happy. Armand is forced to ask his friend for money. However, Manon’s brother reappears whilst Armand is away and convinces her to visit an admirer of hers, the wealthy older man Monsieur Lilaque telling her she must choose between a life of poverty or a life of comfort. Manon becomes the mistress of Lilaque but she cannot forget Armand and writes to him. Her brother finds out and is furious that she is still thinking of him. Desperate for money Lescaut breaks into Lilaque's safe but is caught red-handed and Lilaque evicts Manon from his house. Armand gets to hear about Manon's plight from his friend Francis, but he doesn’t believe it. Francis leaves and Manon enters. Manon and Armand read a poem that revives their love (Still is the way). It proves to be a moment of sheer beauty in what is a very brutal opera. Manon and Armand are together again. Armand is addicted to drugs in order to try to forget the past. Lescaut brings him cocaine in a bar and asks for Manon. When Manon arrives Armand gets angry with Lescaut and Lalique's son who accompanied Lescaut in order to return Manon to his father. Manon tries to calm him, before leaving with the two men. Armand gets word that Manon wishes to see him the next day, when Lilaque leaves. After an intermezzo we find Armand and Manon are together in Lilaque Jr.’s bedroom. Manon is happy under the protection of Lilaque Jr. but Armand yearns for the past. Lescaut appears and warns Armand that he should leave before the servants find him. Armand cuts a picture out of its frame in order to sell it, but is discovered by a servant who reports the incident to Lilaque Sr. who calls the police. Lescaut fights with Lilaque Sr. until Manon shoots the old man with a gun that had been pressed into her hand by her brother. As Lescaut and Armand flee, Manon is arrested. Manon is arrested as Armand appears to try to see her before she is taken away. The music recaps some of the music of their time together. As with Manon Lescaut Treliński employs the two Manons. The effect is far more confusing than its use in Puccini's opera. We seem to be given the impression that Manon is less a victim and more of an agent of her own downfall. It is hard to find sympathy for any of the characters in Henze's opera. Perhaps these days we would feel pity for Armand because of the circumstances that drove him to his addiction. Certainly, Henze's work centres on Des Grieux rather than Manon. Henze's music owes nothing to previous compositions of the Prévost story. He all but abandons the 12 tone system for a more Jazz ladened score. Much of the approach can be felt as inspired by Alban Berg, especially Lulu. The singing was superb. Jason Bridges powerful tenor voice was tested in his role as Armand and he well deserved the applause at the curtain call, as did Sarah Tynan as Manon. This was a great triumph for WNO, as in the past few years that I have been reviewing the company's productions, they have gone from strength to strength. The programming of the seasons has shown great intelligence and imagination, as well as daring. This Spring season is the last in the 'Fallen Women' series of operas. But the forthcoming season, under the title of 'Faith', we will see the company performing Verdi's Nabucco and Schoenberg's powerful, and rarely performed, opera Moses und Aron. The performance will play at the Royal Opera House on the 25th and 26th July 2014. This is a great endorsement of WNO as an outstanding opera company that has consistently provide some of the most exciting opera production over the past three years.